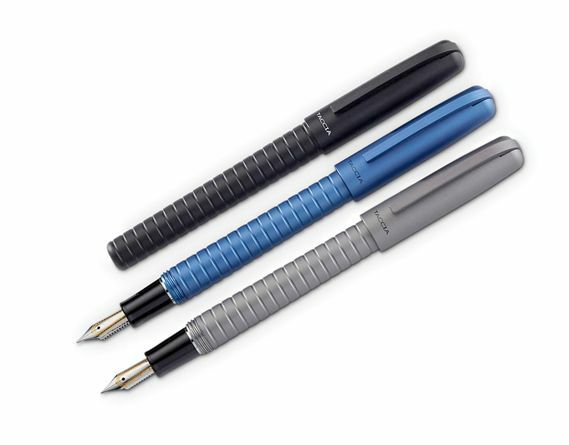 Order your Taccia Pinnacle 14K Fountain Pen today from FahrneysPens.com. Fine Pens, Refills & Luxurious Gifts – great prices & fast shipping. With bold colors, anodized aluminum and industrial design, the Pinnacle Collection represents Taccia engineering at its finest. The Pinnacle is a sleek and sturdy pen, fit for both everyday use and the executive traveler. Strong lines anchor the body, providing style and functional grip. The smooth cap is equipped with a machined, spring-loaded clip and is perfectly threaded to post snugly on the barrel. Each Pinnacle fountain pen comes fitted with a 14K gold Taccia precision Japanese made nib in regular or MUSIC points. Also available with a steel nib. The twist-activated ball pen is a dependable writing partner. In your choice of Gunmetal Black, Aero Blue or Graphite Gray. Cartridge/converter fill.